Obituary – Kopecky, Joseph Johnny « Perry High School Alumni Association, Inc.
﻿- 18 year old son of Mr. and Mrs. Joseph Kopecky lives at 7111 Sixth street. He was born May 11, 1922 in Perry. Before attending the Perry school he attended the Elm Grove school in the country. Since 1935, he has been an active member of the Perry high school band. He has received several awards in his band work. In his sophomore and junior years in high school he was secretary and treasurer of his home room class. Making radio sets is his hobby. His plans for next year are undecided. Joseph J. Kopecky, 70, route one, Marland, died Monday, Aug. 10,1992, at the Baptist Medical Center in Oklahoma City. Funeral has been set for 1:30 p.m. Thursday at the Hartford Avenue Church of Christ in Ponca City. Carl Maples will officiate. Burial will be in the Ceres cemetery under direction of Trout Funeral home of Ponca City. Memorials may be made to the Ponca City Humane Society, P.O. Box 2311, Ponca City, OK 74601. Kopecky was born May 11, 1922, at Perry. 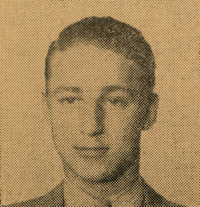 He was a 1940 graduate of Perry high school. On July 30, 1942, he and the former Pauline Reed were married in Perry. The couple made their home on a farm west of Marland. He was employed at Marland Hardware for 19 years, then was owner-operator of Joe’s T.V. until his retirement in 1983. Kopecky continued farming until 1990. He was a member of the Hardford Avenue Church of Christ. Among survivors are his wife, of the home; one daughter, Mrs. Kent (Linda) Allen, Ponca City; a half-brother, Jack Schmiedbauer, Wichita, Kan.; two half-sisters, Jean Ledington and Joyce Smith, both of Guthrie; and a number of cousins, aunts and uncles.